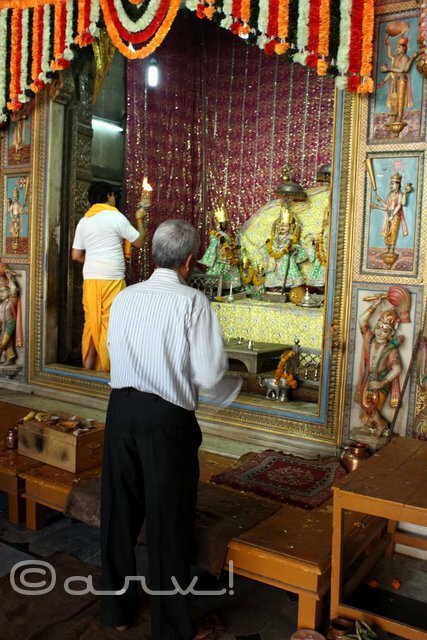 I visited Sri Ram Chandra Temple in Jaipur during the Goverdhan Puja which a day following Diwali. According to Hindu mythology, Diwali is marked with the return of Lord Rama from 14 years exile. As per the Hindu rituals, Goddess Laxmi is worshiped on this day. I’m not sure why Lord Ram is not worshiped on Diwali; is it because of the materialistic human nature? 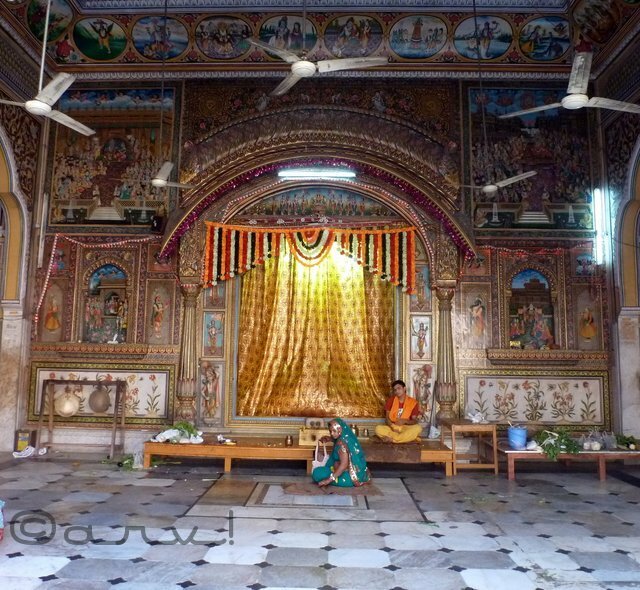 I visited, the only temple dedicated to Lord Rama or Ram in Jaipur. 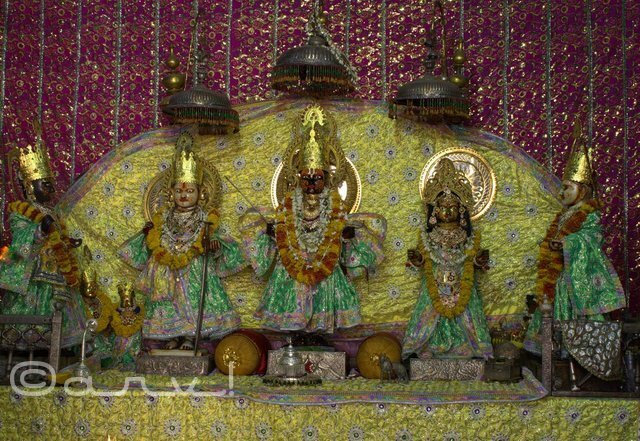 The temple is called Sri Ramchandra Mandir. 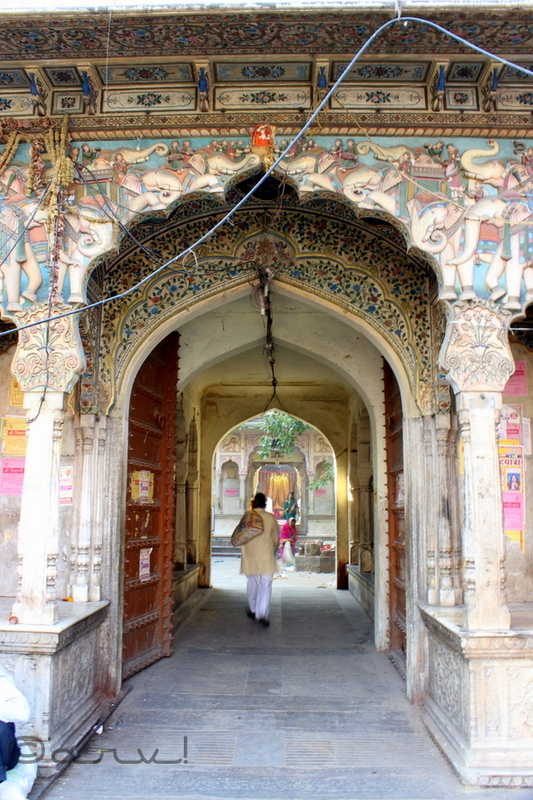 Beautiful workmanship around the entrance gate of Sri Ram Chandra Temple, Jaipur. As seen from Chandpole Bazar. 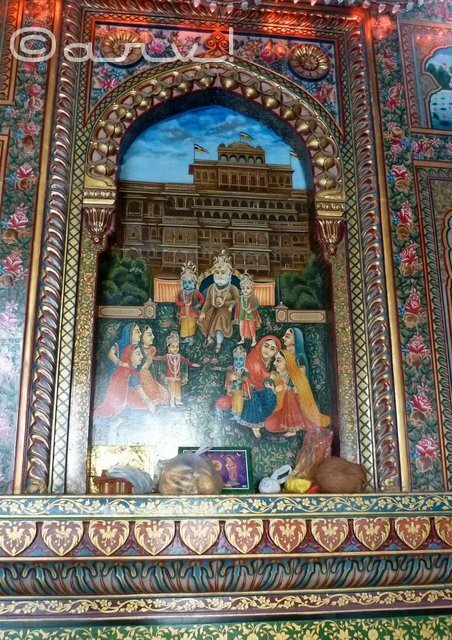 Queen of Jaipur, Maaji Sahiba under the rule of Sawai Ram Singh II constructed Sri Ram Chandra temple in the 19th century. Details are not available on the year of completion of this temple. As per locals, the temple is 150 years old. 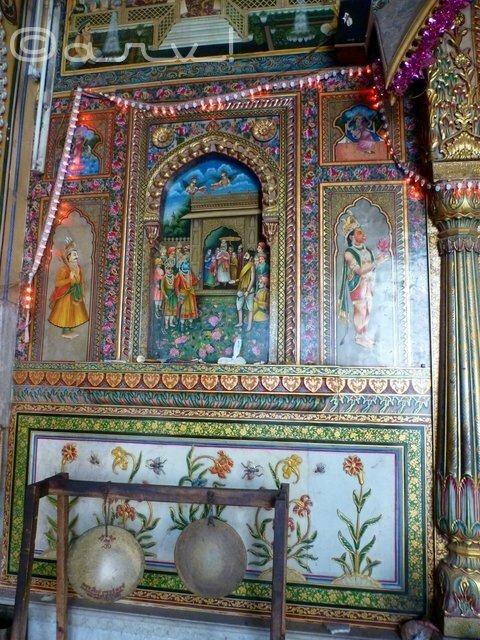 Paintings on the wall of inner entrance gate of Sri Ramchandra Temple. The temple is run and maintained by the family of priest residing in the temple complex. Priest claims that this temple was handed over by the King to his great-grandfather and his lineage is responsible for the upkeep and affairs of the temple. I’m not sure how far this is true, as a habit priest tends to add their own versions to suit themselves!! The temple complex is home to his family and the first courtyard is kind of shabby and unkempt. 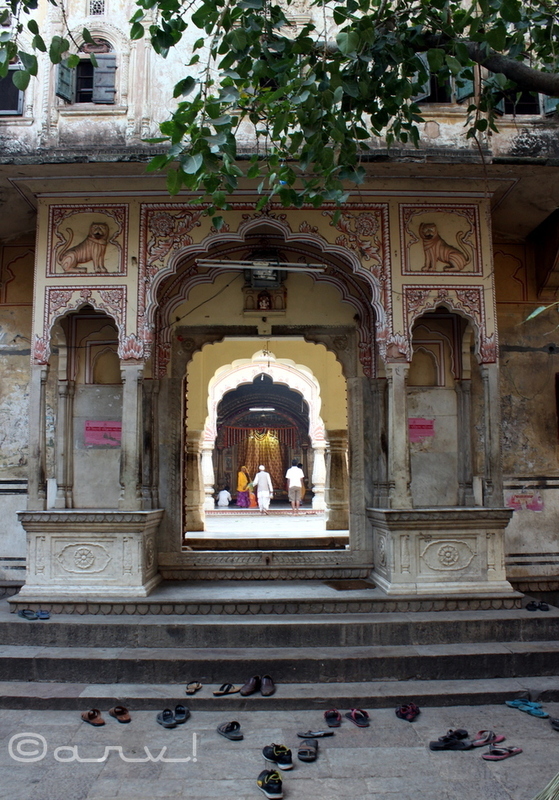 The Sri Ram Chandra Temple is built-in Haveli style. The inner courtyard is quite majestic. The architecture and style give an impression of a royal palace. Another view of the courtyard, facing the entrance. 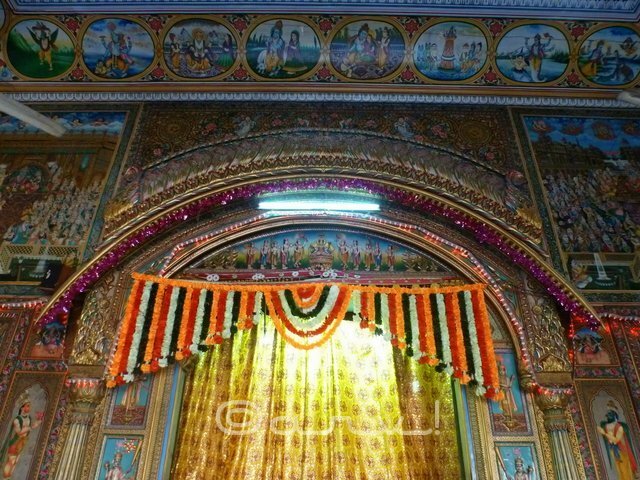 Here are few pictures of the sanctum of Sri Ramchandra Temple, which has beautiful frescoes adorning the ceiling and walls. 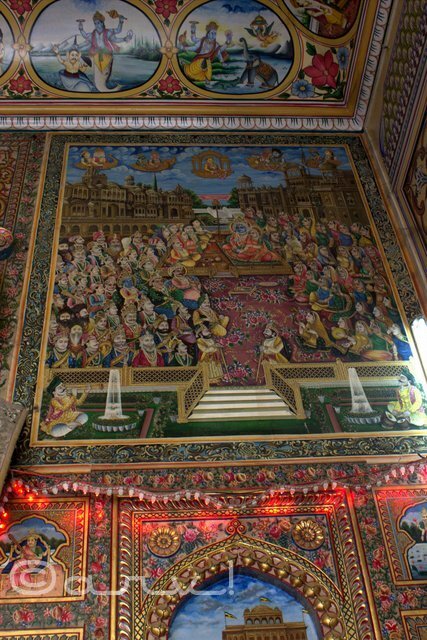 The walls depict the scenes from the Ramayana. Many of these are famous scenes like the one with Lord Rama returning back to his kingdom in Ayodhya after 14 years of exile. Here are a few pictures. 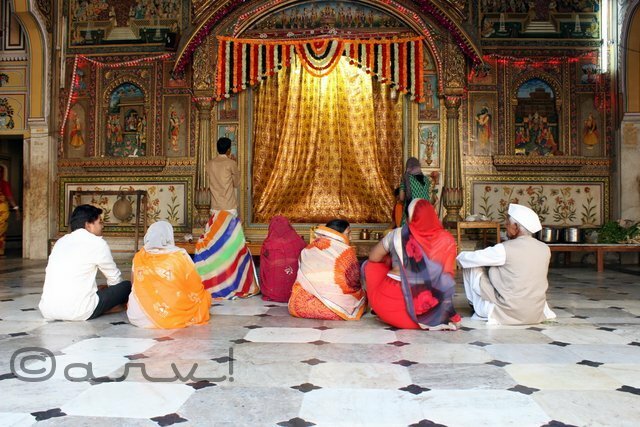 The priest claims that this is the only temple having Ram Darbar in Jaipur. He goes on to add that the only other temple having Ram Darbar in entire North India is the one in Ayodhya, a city that Lord Rama once ruled! 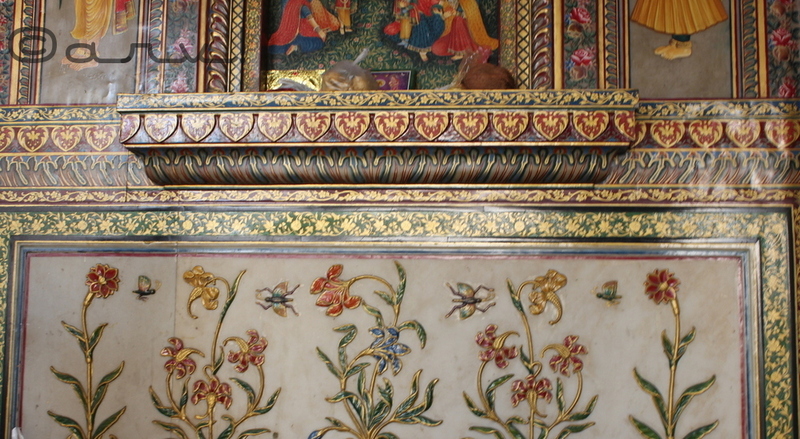 Here are some more elements from the temple, which shows the top-notch workmanship! The people were waiting for the aarti to be performed. One can have darshan or blessings five times in a day. These timings are pre-fixed and vary from season to season. Here are pictures of Aarti in progress. 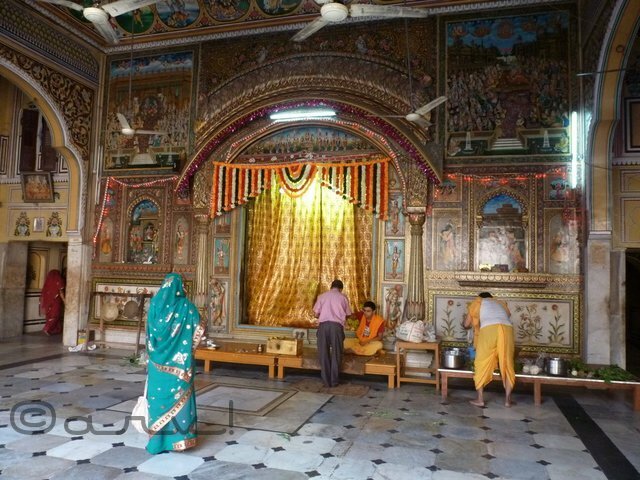 Sri Ramchandra Temple is certainly one of its kind, being the only temple dedicated to Lord Ram in Jaipur. Its beautiful and has been maintained reasonably well. 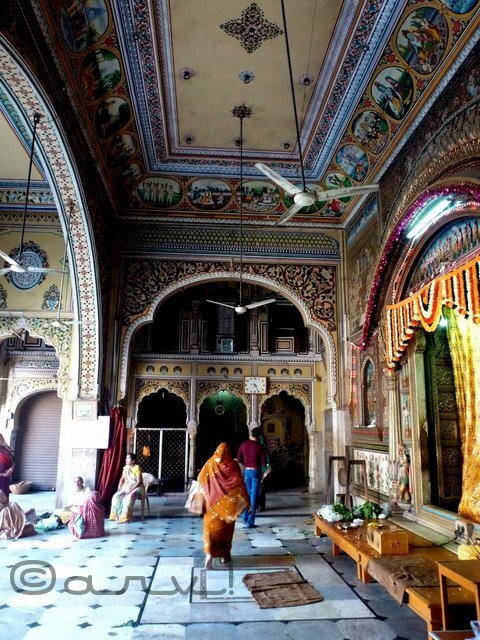 There is another temple in Jaipur with a similar name, located near Hawa Mahal, but it’s dedicated to Lord Krishna. 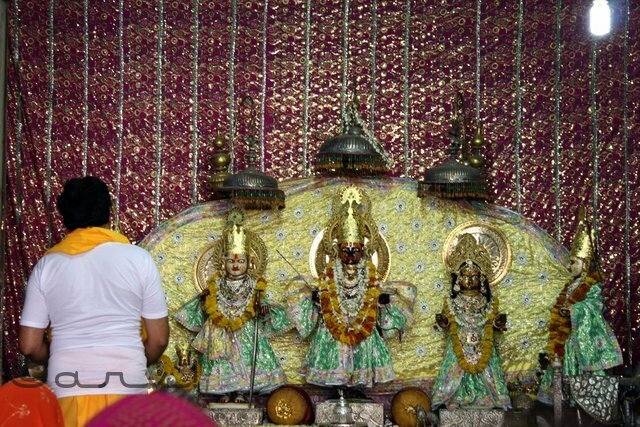 Do visit this temple, if you are in Jaipur. Thanks Ladyfi! 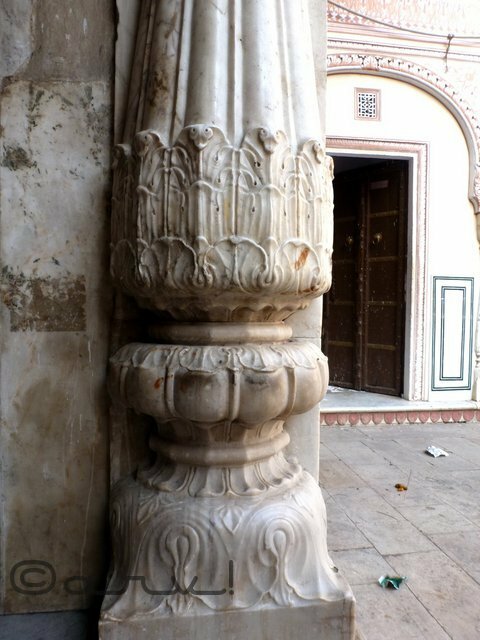 This architecture style is not being carried forward in construction patterns anymore here in Jaipur! I don’t know whether this is a sad aspect or we need to move on! Yes, Jaipur has lots of layers that needs to be uncovered…..Most tourist just scrap the exposed part….while the chunk of it still lays hidden! I’m also discovering new things….every time! 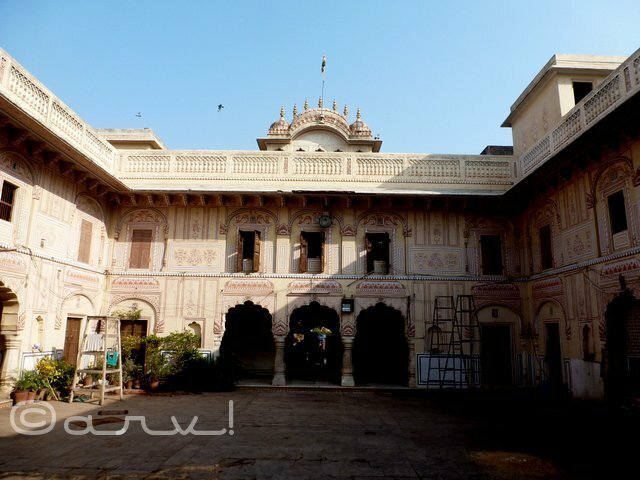 Jaipur has a very rich history and large part of it has been documented by the royal court or recorded by individuals! Thank You Arvi for this beautiful post and exceptional photos.The paintings depicting scenes from the Ramayana are amazing! 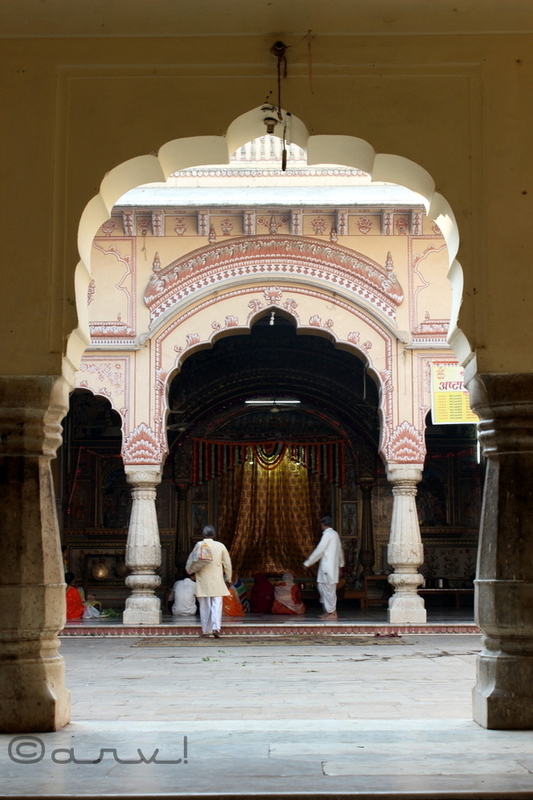 It is interesting to know that that the only other temple in North India having Ram Durbar is the one in Ayodhya. A special thank you for the Arti photos. I’m glad that you liked these photos. As for Ram durbar, this information was given by the priest, I cannot verify this claim though. I assume it must be true. This aarti was a special one -on Goverdhan, Diwali. What a beautiful temple! I love the ornate decorations and elegant arches. 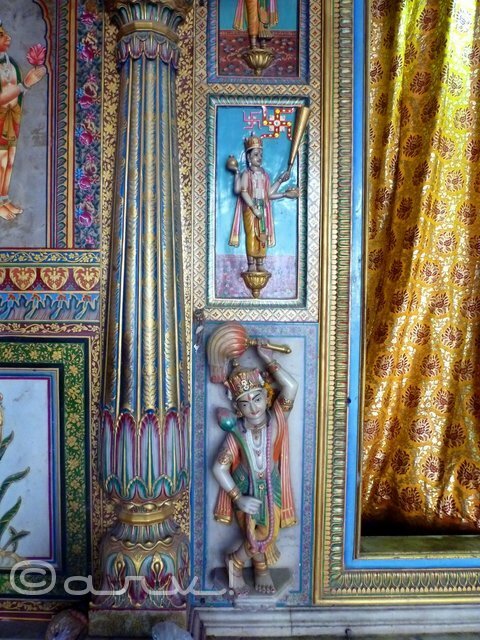 Most of such temples, built by royal family are pretty ornate mostly by architectural construction or frescoes. there are quite a lot of them in city, some have been featured here on my blog as well! Thanks for checking it out! 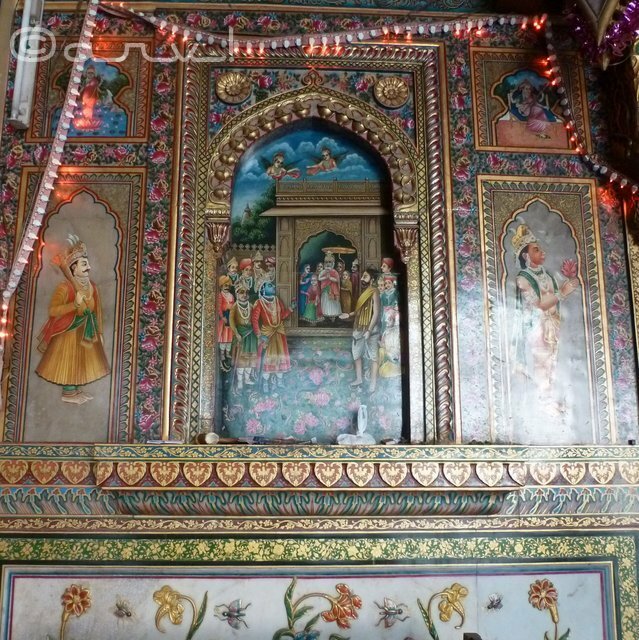 I love the vibrant colours in the temple. Beautiful Arv. Thanks, Josypheen. Happy to know you liked it. Have you ever visited a temple? This is absolutely beautiful, the craftsmanship is amazing! The upkeep and maintenance is impressive, that it is still in this shape today- just wow! We worship Ram ji and Hanuman ji on Diwali. Of course along with Lakshmi ji 🙂 Those are great pictures. I love the arches that you have beautifully captured. Hope you had a lovely Diwali, Arvind! Thanks Parul, It is an old post…2 years to be precise! Of late, many people have started worshiping only Laxmiji! I guess we are becoming more and more materialistic! 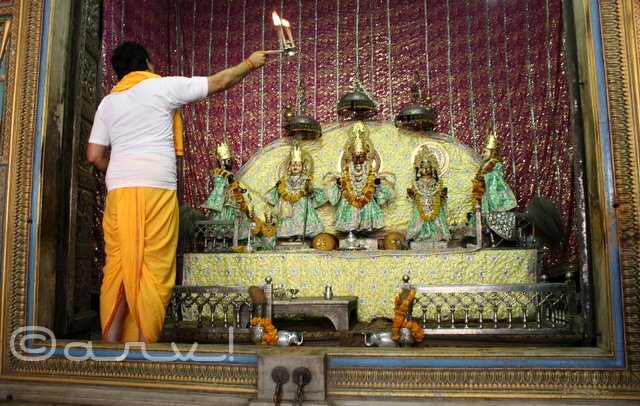 I’m sure there must be even greater following for Lord Ram in UP since Ayodhya is in UP! 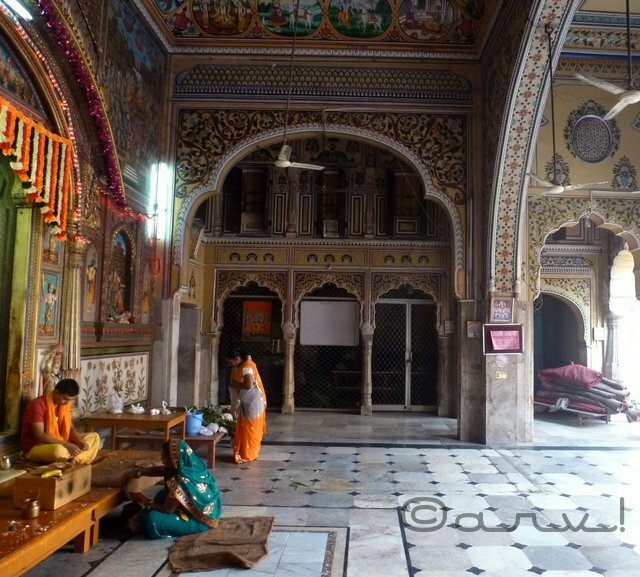 Pingback: Goverdhan Nathji Temple, Jaipur – Jaipur Thru My Lens !! 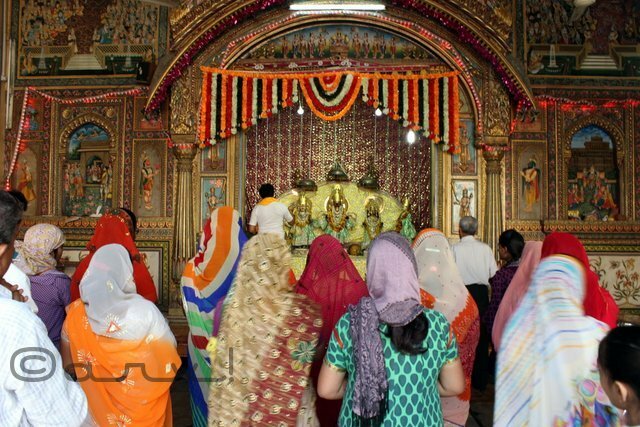 Pingback: What Makes Jaipur One Of The Best Places For Celebrating Diwali In India? – Jaipur Thru My Lens ! !